with knows less than they think they do about chess/engines in general. wins that event, I myself (and most chess players) will use Komodo and Stockfish...plus a couple of others. 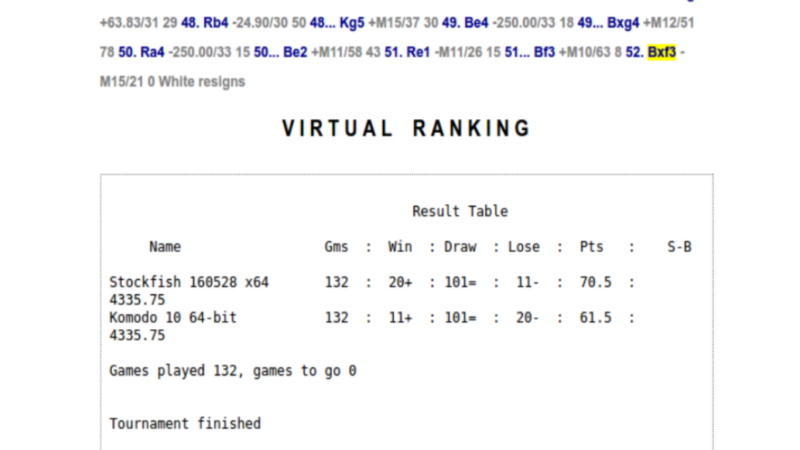 Which Version of Stockfish plays the Games below ? 1. d4 Nf6 2. c4 e6 3. Nc3 Bb4 4. e3 O-O 5. Bd2 b6 6. Bd3 d5 7. cxd5 exd5 8. 45. d5+ Kd6 46. Rd4 h5 47. Kf1 Re3 48. b4 f3 49. gxf3 Rxf3+ 50. Kg2 g4 51.
hxg4 hxg4 52. b5 Ke5 53. Rd1 Kxe4 54. d6 Rf8 55. Kg3 Ke5 56. d7 Rd8 57. 1. c4 e5 2. Nc3 Nf6 3. Nf3 Nc6 4. e4 Bb4 5. d3 d6 6. a3 Bc5 7. b4 Bb6 8. Be3 O-O 9. Be2 Bg4 10. O-O Bxf3 11. Bxf3 Nd4 12. Na4 Qd7 13. Nxb6 Nxf3+ 14. Qxf3 axb6 15. Bg5 Ne8 16. h3 Ra7 17. Rfe1 c6 18. a4 Nc7 19. Be3 Rfa8 20. 69. Kg1 Nf7 70. Bd2 Kg8 71. Kh2 Kh8 72. Be1 Kh7 73. Ra1 Re8 74. Bc3 Ne5 75.
g3 Qh5 76. Kg2 Rea8 77. Ra2 Qg6 78. Rf5 Rc8 79. Qe2 Raa8 80. Qd1 Rd8 81. Rf1 Re8 82. Kh2 Rh8 83. Qc2 Rhe8 84. Kg2 Red8 85. Rf5 Ra7 86. g4 Raa8 87. Re7 100. Qe2 Ree8 101. Kh2 Ra7 102. Bf4 Rea8 103. Qd1 Re8 104. Bg3 Ra5 105. 111. Kg2 Qd7 112. Raf1 Ra5 113. R5f2 Rea8 114. Ra1 R5a7 115. Qd1 Ra5 116. Ra5 128. Rf5 Qe7 129. Ra2 Qe6 130. Ra1 R5a7 131. Bxe5 dxe5 132. h4 g6 133. 139. Ra3 Ra5 140. Rf1 Raa8 141. Kg3 Re8 142. Kf2 Ra5 143. Ke3 Raa8 144. 155. Kd2 R5a7 156. Kc3 Kf7 157. Kc2 Ra5 158. Kb3 Ke7 159. Kc3 R5a7 160. 166. Raa1 Rd8 167. Kc2 Ra7 168. Rf1 Raa8 169. Rf3 Ra5 170. Kc3 Rd4 171. Raa8 177. Rff1 Kd6 178. Kd1 Rf7 179. Rf2 Ke6 180. Kc2 Ke7 181. Kd1 Ke6 182. 8. Be2 exf3 9. Bxf3 Be7 10. O-O O-O 11. d4 c6 12. Re1 Na6 13. Bf4 Re8 14. Which Version of Stockfish played the Game below ? Ndb4 8. Nxc6 Qxd1+ 9. Kxd1 Nxc6 10. Nc3 Bf5 11. e4 O-O-O+ 12. Kc2 Nd4+ 13. Rg8 38. Rxh3 gxh3 39. Rxg8 h2 40. Rg7+ Ke6 41. Rh7 Rd1+ 42. Kb2 h1=Q 43.
result. Of course you wont have the same hardware etc but maybe it will give you something to do with your time. On the other side of the coin if you feel that you must bore us with your tedious posts then I hope you will also include the games that Stockfish should lose as well. Perhaps not, that would be against your little grey cell/one way view of the world wouldn't it. because you are just unable to be objective about anything. Interesting site...but has nothing to do with the TCEC tournament is it, or the same time controls etc. 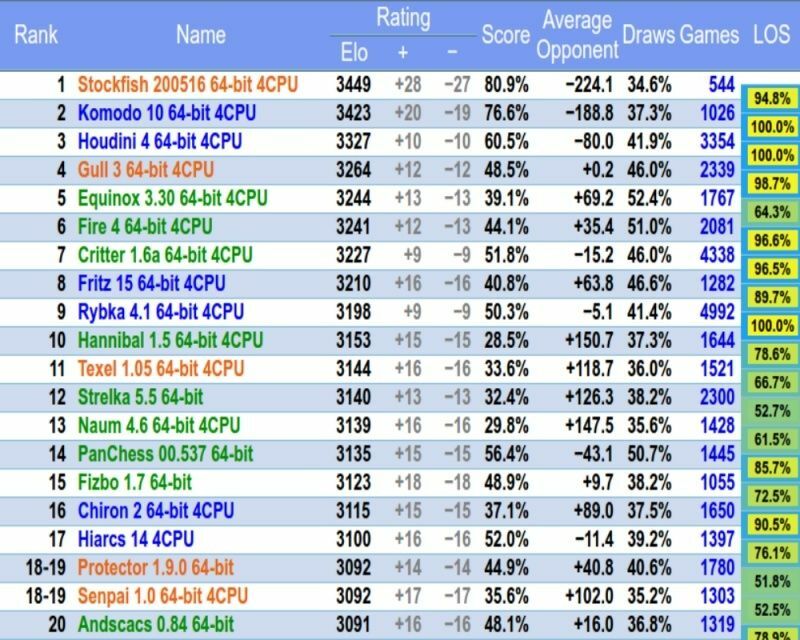 Which Version of Stockfish played the Games below ? 1. Nf3 c5 2. Nc3 Nc6 3. e4 e5 4. Bc4 Be7 5. O-O Nf6 6. Re1 O-O 7. h3 a6 8. 45. Na3 Re5 46. Rxd4 Rd5 47. Rxd5 Kxd5 48. Nc2 h5 49. f4 g6 50. Kh3 Kc6 51. Kg2 Kb5 52. Kg3 Bd8 53. Kh3 Be7 54. f5 gxf5 55. Kg3 Bxb4 56. Kf4 Be7 57. 1. Nf3 g6 2. c4 Bg7 3. d4 Nf6 4. e3 O-O 5. Be2 c5 6. d5 e6 7. O-O exd5 8. 33. Qa6 Rd1+ 34. Rxd1 c1=Q 35. Rxc1 Rxc1+ 36. Kf2 Ne4+ 37. fxe4 fxe4+ 38. Chess Lessons for beginners, a comprehensive guide. posts, it matters not if any of the posts are even interesting or worthwhile, just as long as you can see your name you will continue to post the same thing time after time. It must be a sad little world you live in, but that is your problem, it is just unfortunate we are forced to put up with it. Now try (really hard) to understand this, Stockfish is a good engine, but the table/rating you keep coming up with (time after time) is for Blitz chess, 40 moves in 4 minutes. 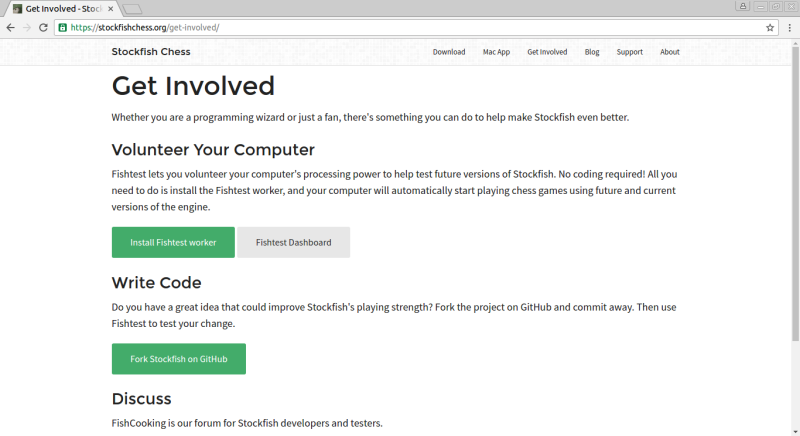 care which engine wins myself as I am able/do use Stockfish and Komodo. Thank you for proving the point....who's a clever little boy then. 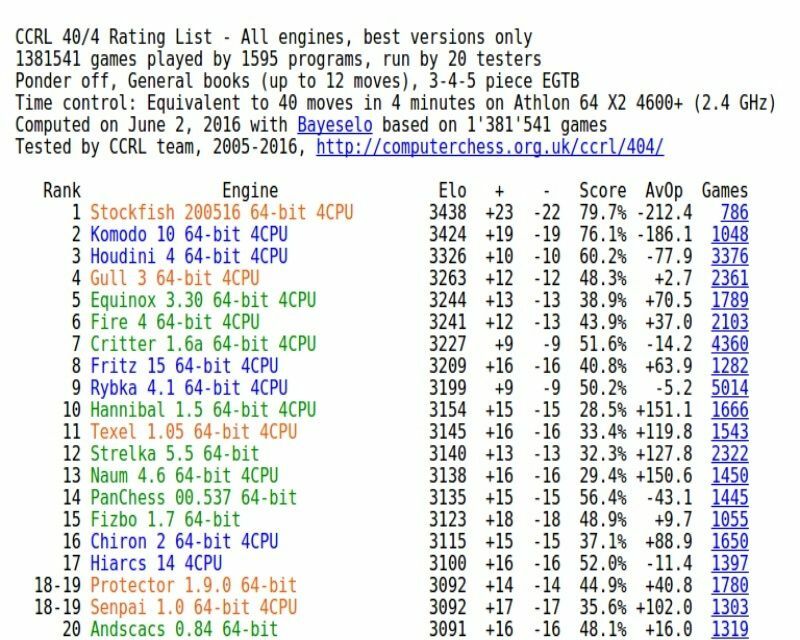 Stockfish is not the best engine ... test it and compare f.e. on BT 2630 tasks! Just look at some other tables/rating tables.... The whole world knows it is in the top 3. That's a good idea, why don't you 'volunteer your computer'.